GageStation is a combination license of both QC-Gage and QC-CALC Real-Time for a gage bench. QC-Gage simulates the inspection technique of an automated inspection device such as a CMM. 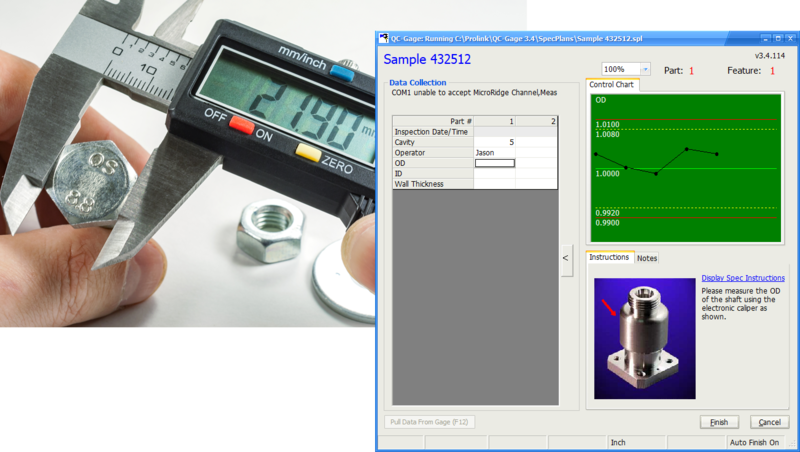 You program QC-Gage through a simple wizard by answering questions that describe the sequence your inspectors must follow. These “Spec Plans” are saved and run by your inspectors, leading them in a consistent sequence of inspection. When all data and trace information (serial number, lots, names, etc) is entered, it is then sent to QC-CALC Real-Time where the data is plotted and any reporting and exporting is performed.